The Telr PrestaShop Extension allows merchants who use the PrestaShop system to take payments via the Telr Hosted Payment Pages. No card details are captured by or stored within the PrestaShop system, so there are no PCI requirements for the store. When the customer places their order and selects Telr as the payment method, they will be taken to the Telr secure server to enter their card details. The result of the purchase attempt (authorised or otherwise) is sent back to the PrestaShop system to update the order details. The customer is also returned to the store. Click HERE to download the PrestaShop 1.7.x plugin. You should take a back-up of your system before installing the extension. After extracting the plugin zip fie, Copy the ‘telr_payments’ to the ‘modules’ directory found in your main PrestaShop installation. You should end up with the Telr module installed as modules/telr_payments. 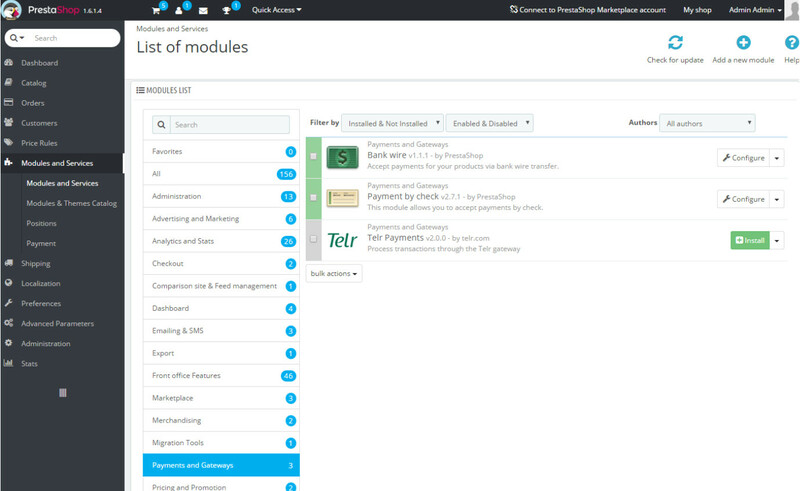 From the PrestaShop admin system, select Modules and Services from the side menu. Within this, select Payments and Gateways, and set the filter to Installed & Not Installed. This will list the payment modules available, you will need to click on Install next to the Telr module. PrestaShop may ask you to confirm the installation, click on ‘Proceed with the installation’. You then need to edit the settings for the payment method. Your Telr Store ID is displayed in the top right of the Telr Merchant Administration System, and you must only enter the numeric part of the ID, not the full store name. The authentication key can be found in Telr Merchant Administration System in Hosted Payment Page V2 configuration page, under the Integrations menu. The payment page can be customised through the use of a CSS file. The core page display is based on the BootStrap 3 responsive layout. You should ensure that you are familiar with the underlying styles used within Bootstrap before making any CSS changes. For more details please check the Hosted Payment Page integration guide. After the consumer enters their card details, the payment gateway will check to see if that card is enrolled as part of the Verified by Visa or MasterCard SecureCode authentication systems (known as 3D-Secure). If the card is part of one of these authentication systems, then an additional page is displayed which requires the relevant authentication details to be entered. This is usually in the form of a password that has been assigned by the consumer or via a one-time code sent to the customers mobile. The actual data entry section is presented directly by the card issuer and cannot be customised. It is generally displayed on a white background. Where possible the 3D-Secure authentication form is displayed over the payment page, allowing the customer to see that it is clearly part of the payment process. When you are ready to start processing live transactions, you must ensure that the IP details of your PrestaShop server have been entered into the Payment Page V2 configuration with the Telr Merchant Administration System. These card numbers can be used when testing your integration to the payment gateway. These cards will not work for live transactions. The card security code (CVV) to use with the test cards is 123 (except for American Express, which should be 1234) for an authorised response, other codes will be declined. Cards which show ‘Yes’ in the MPI column will use a simulated 3D Secure authentication page, allowing you to test the transaction flow when Verified by Visa or MasterCard SecureCode is used. When it test mode, and when using the above test cards, you can simulate any of the transaction response codes by using specific values for the card security code (CVV). By taking the response code you want to simulate, pad that code with a leading ‘0’ in order to make it a 3 digit code and use that for the CVV. For example, to simulate the Insufficient Funds response (status ‘D’, code ‘41’) use 041 as the CVV. You can also simulate an on-hold transaction in the same way. On hold is where the transaction has been authorised, but the anti-fraud system has flagged the transaction for inspection. Whilst the transaction is on-hold, no funds will be debited from the customers’ card. You would need to use the Merchant Administration System to either accept or reject the transaction. To simulate the on-hold response within the test system, use a CVV value of ‘999’ with one of the above test cards.